In an energetic and information-packed on-court presentation, Coach Krzyzewski explains the zone offense and principles he uses in attacking a half-court zone defense. Krzyzewski believes the secret to effective zone offense is to keep it simple by running one highly effective offense that can be utilized against even the most potent defenses. 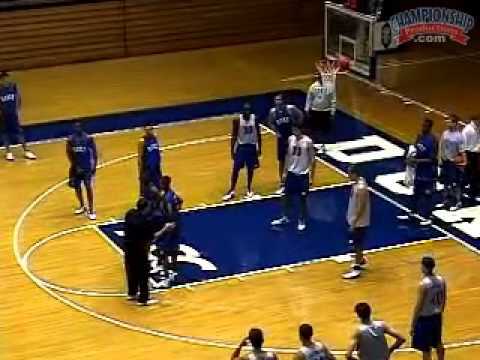 Coach Krzyzewski has designed a zone offense that is easy to implement and impossible to stop! In addition, Coach K shares the five major components of this efficient offense when invading the zone. Coach K teaches all of these principles in-depth and provides numerous drills for attacking the 2-1-2 and 1-2-2 zone. This video is essential for any coach interested in learning how to execute Coach K's simple offense and the best, most efficient way to breakdown a zone defense. 2 Ratings were entered with no review. Mike Krzyzewski: Duke Basketball - Attacking the Zone 5.00 out of 5 based on 1 ratings. 3 user reviews.